The most popular pieces of jewellery among the wealthy were magnificent gold chains, pendants, rings and ‘hattagraffs’ – a type of decorative clasp. Stones often used in 16th century jewellery were diamonds, rubies, emeralds and sapphires. Pearls and pieces of enamel work were also used. The jewellery was worn to signal power and wealth, but also to protect against evil forces or bring luck. Not anyone could wear any jewellery – there were strict rules to limit luxury consumption and mark social boundaries. The jewellery was made by hand by skilled goldsmiths. There were also strict rules regarding who could work with gold, enamel and precious stones. Flowers and diamonds were key elements of jewellery art in the 17th century. Jewellery fashion changed with printed patterns, which spread from Paris and inspired goldsmiths in the rest of Europe. 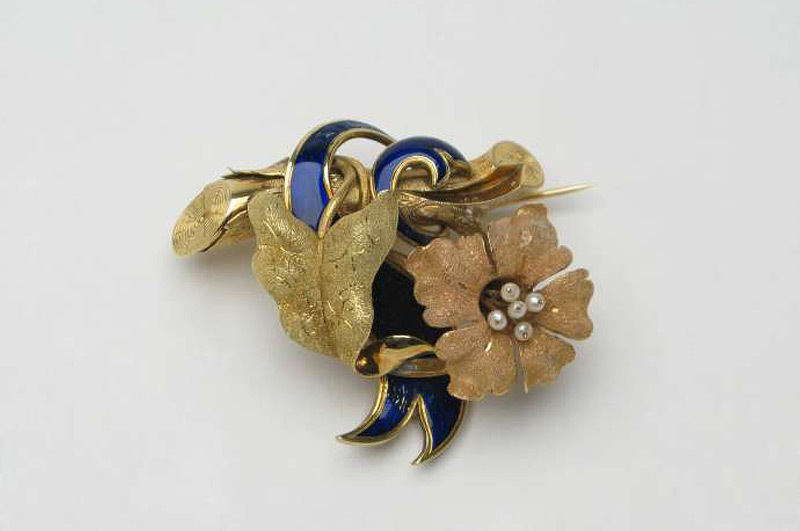 The brooch became the fashionable jewellery. 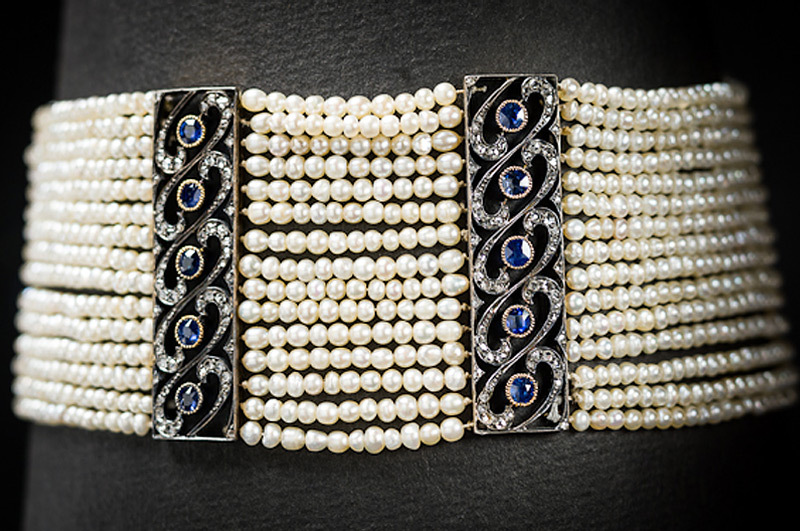 Jewellery made of gold, enamel, pearls and cut gemstones sewn directly onto the garment became very popular among the wealthy. Jewellers had learnt to facet the gems so that they glittered even more. World trade increased and more jewellery stones came into circulation. Diamonds and pearls became hallmarks of the Rococo period. The diamonds were often set in silver to make them appear even more dazzling against the white metal. The reverse of the jewellery was often gold. The women of the court wore costly jewellery on their fronts, beginning in the décolletage and narrowing down to the bodice. 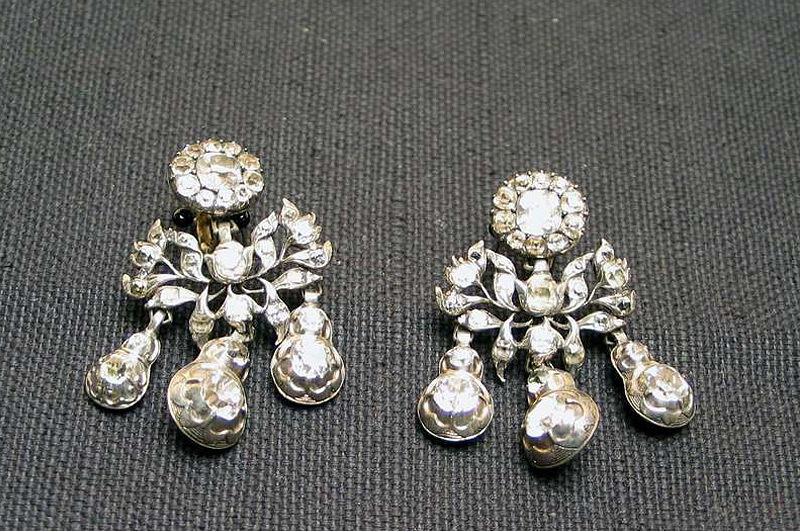 Girandole earrings – with three suspended drops – were modern, as were rosettes. Fashion and jewellery art were characterised by inspiration from Greece and Rome, through archaeological excavations of ancient cities. Jewellery in simple forms was worn with thin cotton dresses with highly-cut waists. Large hoop earrings were a novelty, as were necklaces composed of narrow chains. Rings and lockets with motifs from classic architecture also appeared around this time. Cameos (gemstones with images in relief) and jewellery made from polished steel were in demand. The 19th century was a time of great economic, political and social change. Jewellery fashion continued to be characterised by increased historical awareness, and ornamentation from jewellery in previous eras was re-used. Factory-made fashion jewellery in cheaper materials – costume jewellery – became increasingly common. Pictures of new fashion items were distributed in fashion magazines and newspapers. Travel increased with the new steam boats and trains – fashions spread faster, to more and more people. In artistic circles and among the higher echelons of society, there was concern that traditional culture was vanishing. A national romantic style developed in dress and jewellery, with no link to local usage and function which, for example, folk costumes had had before. 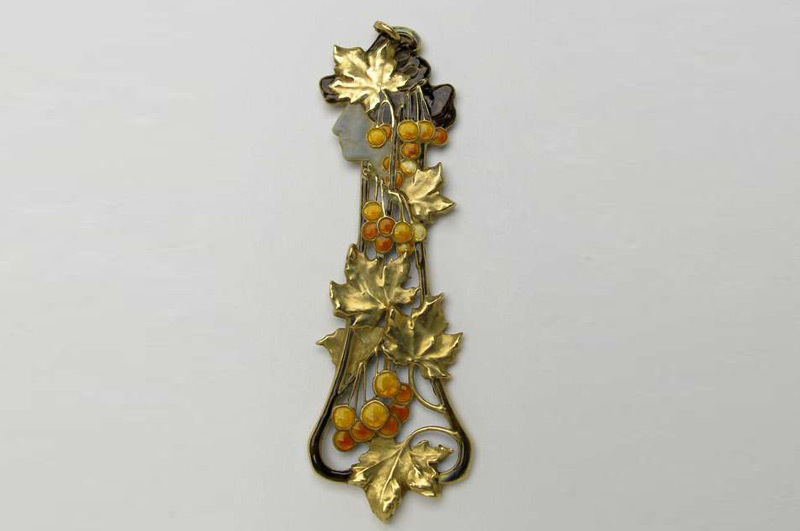 Art Nouveau took its patterns from nature, using animals and plants as decorative ornaments. The female form also provided inspiration. The French version of the style was predominant, but at the same time a more geometric variant emerged, particularly in Austria and England. The jewellery was made both by hand and by machine. Every conceivable material was used: pewter, horn, iron, wood, silver and gold. Many European countries were industrialised in the 19th century. Art Nouveau arose from attempts to find a new style for the new era, completely independent of the old styles. Jewellery art changed dramatically during the 20th century. Personally designed jewellery has always been desirable, but from the early 1960s jewellery art explored new paths. Influences from other art forms and the use of unusual, often inexpensive materials, created more individual jewellery fashion. Naturally, conventional jewellery fashion developed in tandem with this new art form. The front part of the finger ring has a figure composition representing Saint Anne (the mother of the Virgin Mary), the Virgin Mary and Jesus Christ as a child. Finger rings were extremely popular during the Renaissance. They were worn on all the fingers – except for the middle finger which was considered unclean in Roman culture because it was usually used in toilet business. Rings were also worn on the outer finger joints. 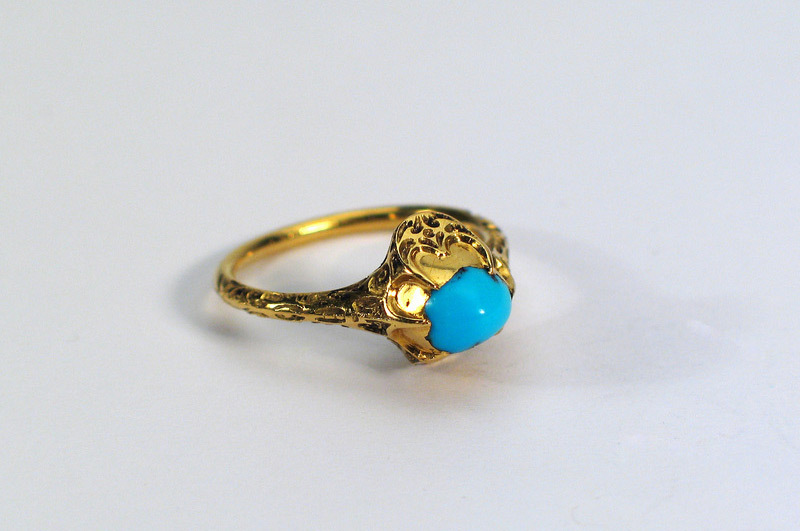 The turquoise stone took its name from the French term pierre turquoise, which means Turkish stone. The name is a misunderstanding because the stone is not found in Turkey, but Iran. Trade between Turkey and Western Europe in the Middle Ages meant the stone was associated with Asia Minor. The turquoise stone was mined in Sinai as early as 4000 years BC and has been popular during different periods. 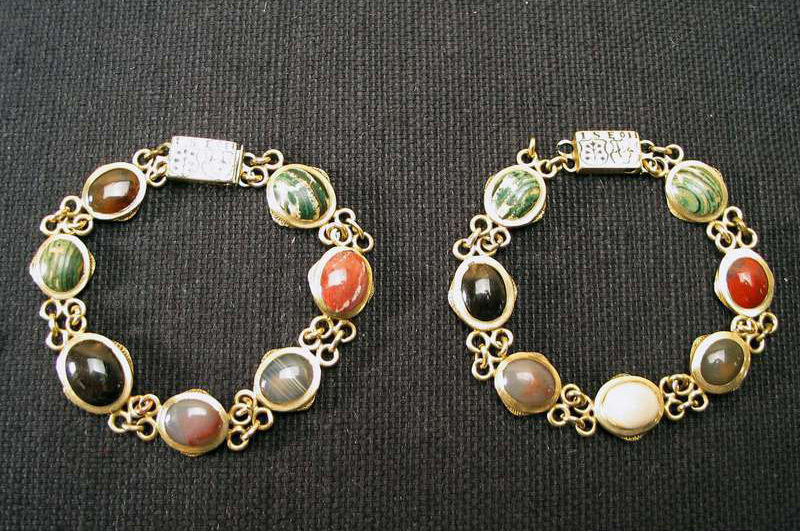 Up until the mid-19th century, bracelets were always worn in pairs. These examples have clasps with two coats of arms for the Stake and Oxehufwud families. According to reports, the bracelets belonged to Elisabeth Oxehufwud who married Johan Stake in 1635. Perhaps the stones and their position were thought to have magical powers. Each stone sits in a bezel setting where the metal covers the sides. Pendants were popular in the 17th century. They were often structured like this – a loop at the top for the chain, then a decorative centre piece and an oriental pearl at the bottom. 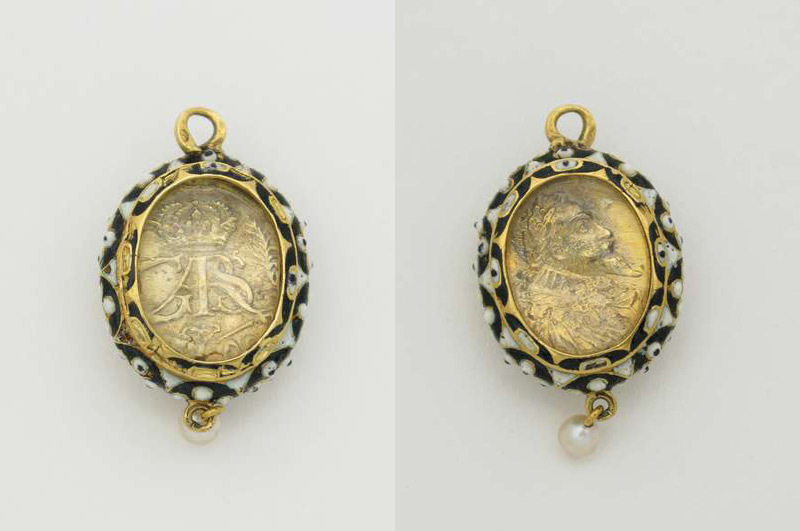 King Gustav II Adolf's image appeared on many pendants, memorial medals and chains made in Germany just after 1632 when the king fell at the Battle of Lützen. On the back are the letters GARS (Gustavus Adolphus Rex Suecia) below the royal crown. Earrings for pierced ears (hooks missing). The upper part can be opened and is a little hiding-place for surprises. Both contain small sheep shears made of steel. The fashionable hairstyles of the late 16th century with back-combed hair meant the ears were visible. This inspired the goldsmiths to produce earrings not only for women but for men too, who often wore just one earring. 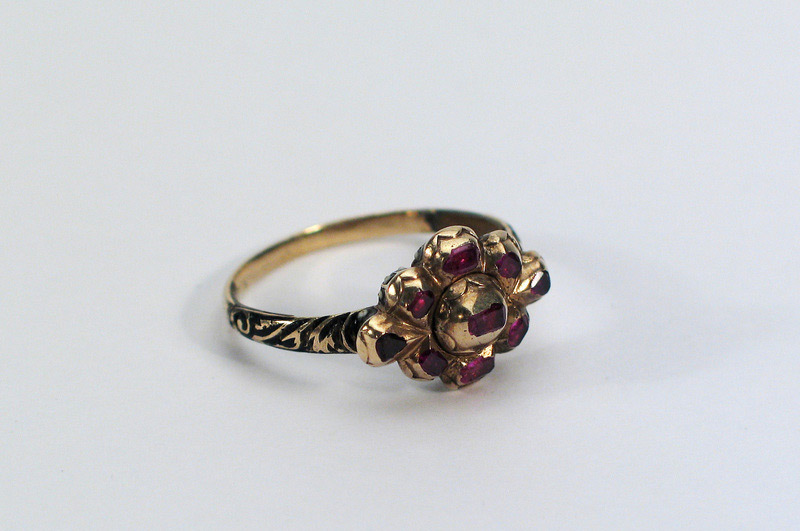 This type of ring has been in fashion from the 17th up until the 20th century. The ring could very well be made in Sweden. The red stones, garnets, could be a symbol of love, or of devotion, powerfulness and grace. 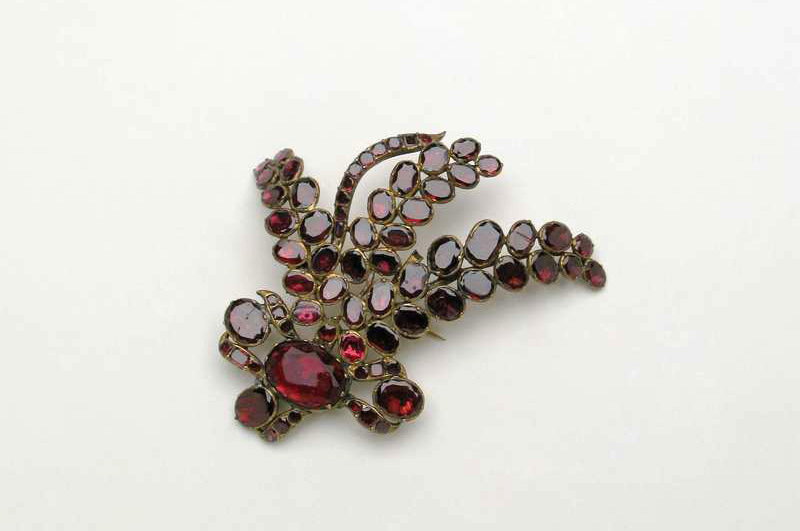 Garnet was used as long ago as ancient Egypt right up until the early 20th century. Today new mines containing green garnets have been found, and the stone is now regaining popularity. Old inventories from the 17th and 18th centuries often describe jewellery as containing 'Swedish diamonds', i.e. rock crystals. 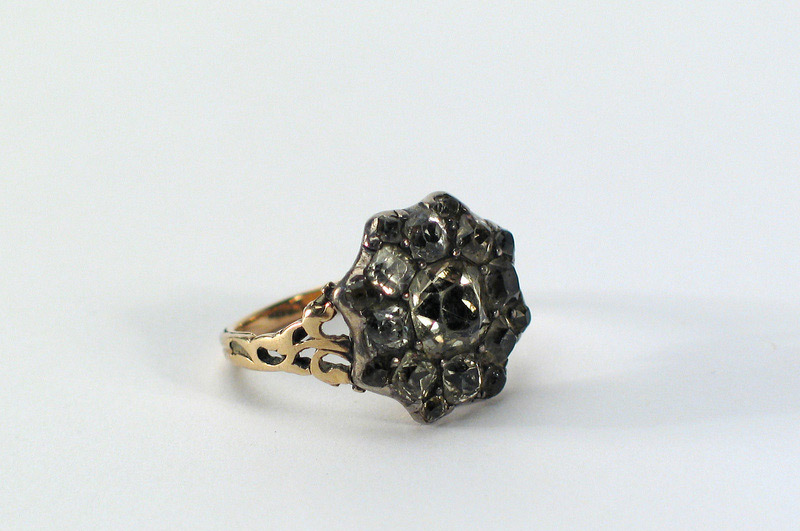 This 18th century ring has an octagonal front piece with nine inset foiled rock crystals. It was very commonplace for white stones to be set in silver to enhance their radiance. Earrings and brooches with a rosette formation at the top, foliage beneath and finally three suspended drops, are called girandole earrings. The word is French and means candelabra, a large candlestick. Diamonds, faceted rock crystals and glass stones became some of the most popular jewellery stones during the Rococo period. In order to appear even more dazzling, the faceted stone was set in a 'covered setting', with a small piece of shiny silver foil under the stone itself. Sets like this one, made from glass and imitation metal, were common during the Rococo period, particularly in England and France. To give the jewellery extra lustre, the glass stones have been set with foil on the reverse. The necklace was tied at the nape with a silk ribbon. 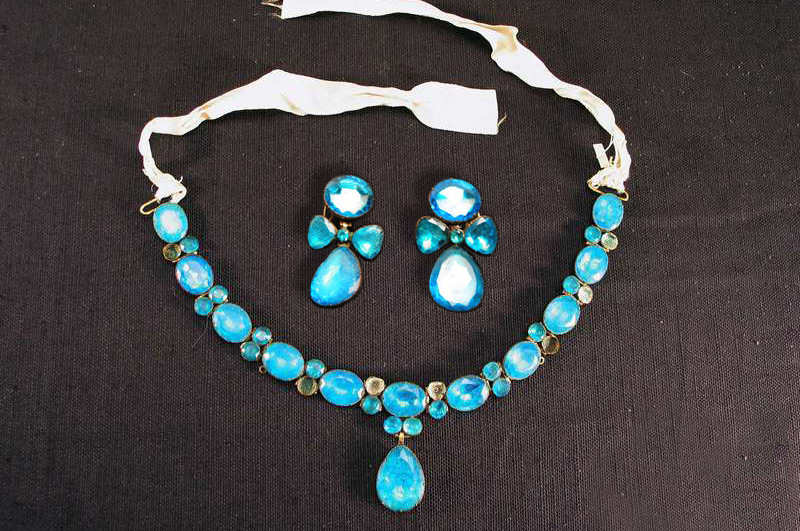 Colour was an important feature of 18th century jewellery. Sometimes precious stones in all the colours of the rainbow were used. Here the manufacturer has used faceted glass stones which have been coloured by adding metal salts to the melted glass. The aigrette, from the French word for plume, was designed to decorate a woman's hairstyle or a man's hat. It was used only in the very highest echelons of society and could be set with diamonds or, as here, with simpler stones. Aigrettes were fashionable in the 17th and 18th centuries. They came back into use at the beginning of the 20th century. 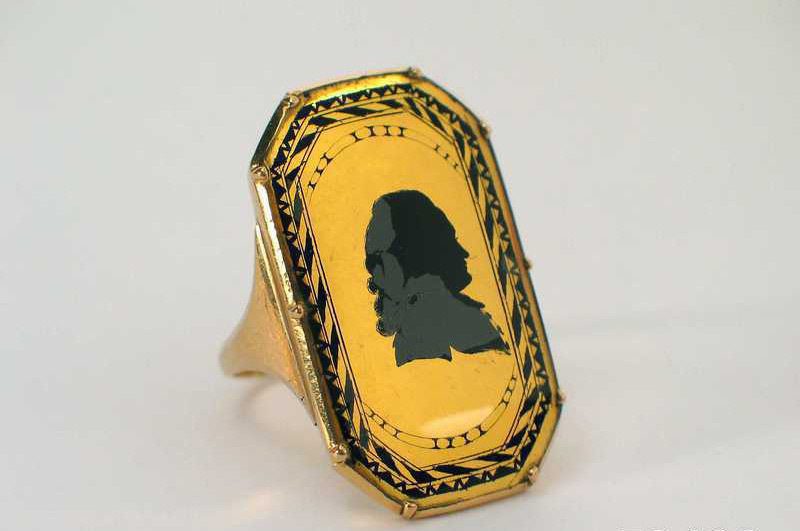 The ring's silhouette depicts doctor of theology P. P. Ekelund and is painted in Indian ink on a gold plate, covered by an arched pane of glass. 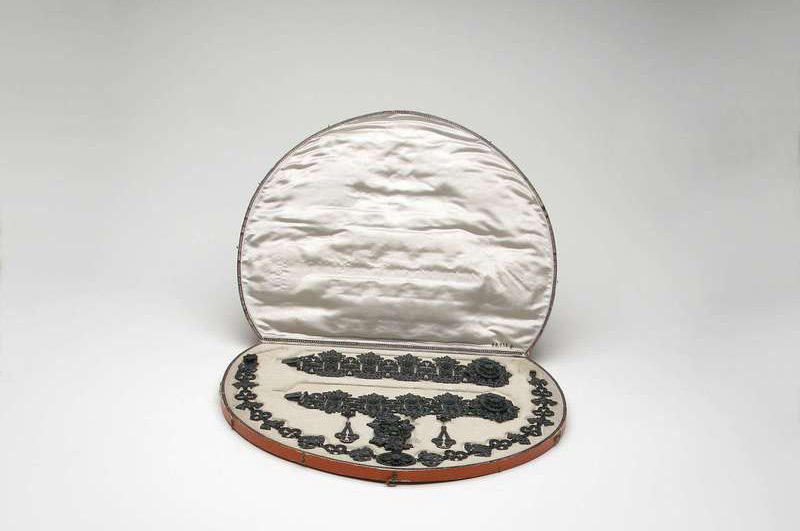 Brooches, lockets and snuff boxes were also decorated with silhouettes. This form of art is said to have been introduced by Étienne de Silhouette, the Controller-General of Finance during the reign of King Louis XV. It became particularly popular in Germany and England. Silhouettes were also used as jewellery for mourning, particularly in England. 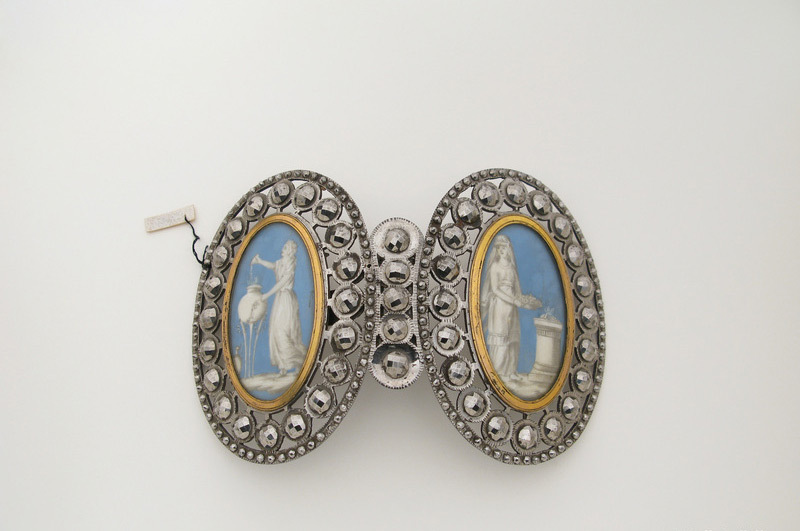 The lockets of the costume's clasp are painted on ivory in white against a blue background. The artist wanted to imitate the bisque porcelain made at England's famous Wedgwood pottery in the 18th century. The clasp has a framework made of faceted steel pins. Steel jewellery was made as far back as the Renaissance period in England, France and Germany. Swedish steel was famous already in the 18th century and was used in the continental jewellery industry. 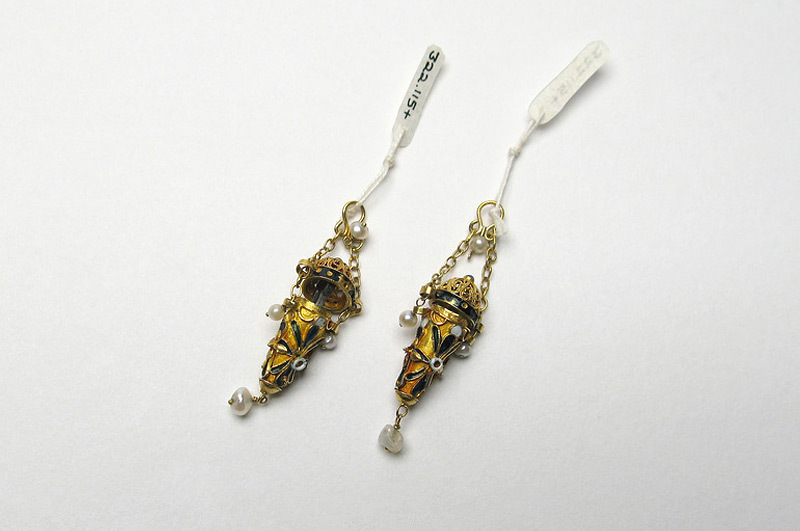 The earrings, the actual hook is missing, are decorated to look like quivers (arrow holders). 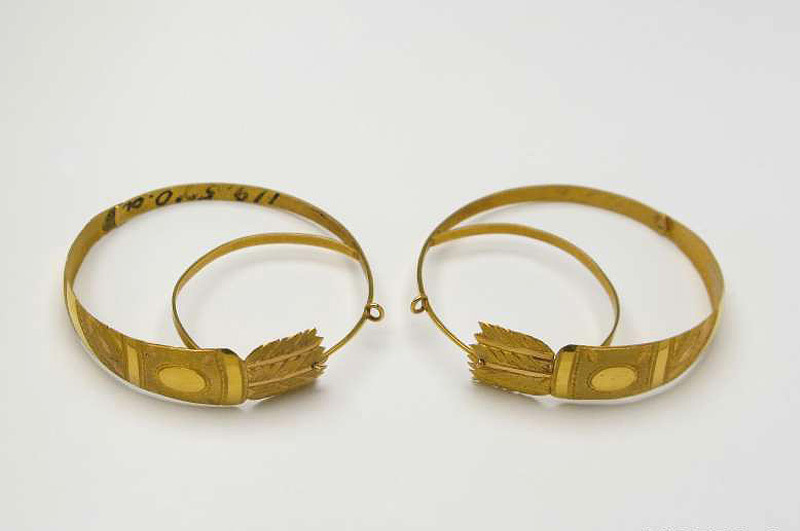 Large, round, paper-thin gold earrings, known as creole earrings, became extremely popular at the beginning of the 19th century. The first evidence of men and women wearing jewellery in their ears dates back to 3000 BC, but people had probably done so far earlier than that. The set bears the mark "Geiss a Berlin"; geiss is German for cast. There are two main types of steel jewellery. One comprises small metal pins faceted and mounted into jewellery. The other type, like this set, is cast and often called 'Berliner Eisen'. 'Eisen' is the German word for iron. The royal Prussian iron manufacturer was noted for its precision castings. Berliner Eisen was never really considered an inexpensive replacement for gold and silver, but was desired and popular at this time. Cameos, engravings in relief, made from lava started being made in Italy in the mid-19th century. They were travel souvenirs, often sculpted from lava from the volcano Vesuvius. 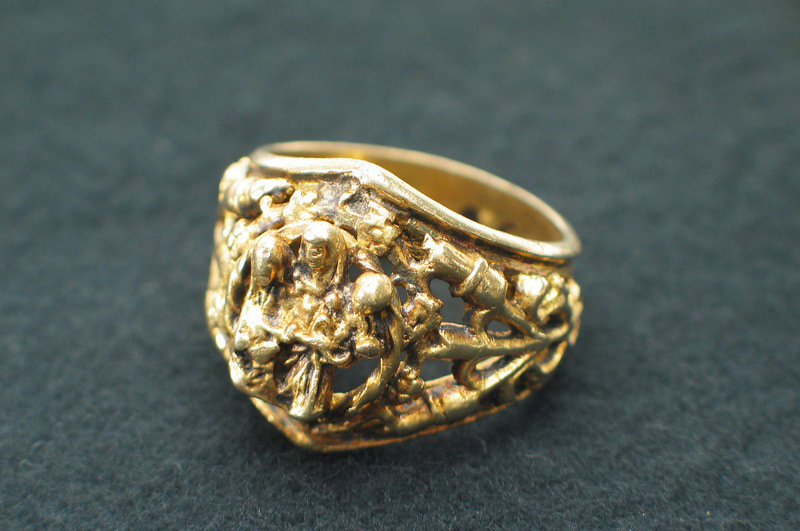 Lava cameos were popular worn with mourning clothes, once the initial deep sorrow had passed. Cameos have been made since 2000 BC. 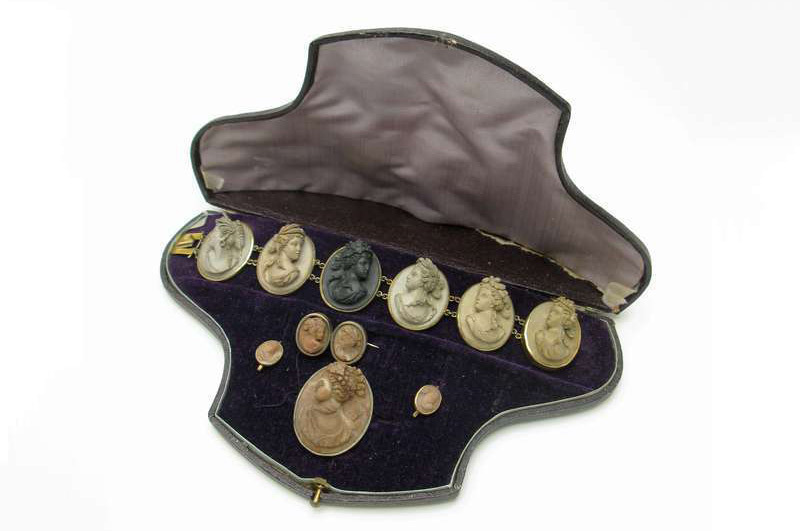 Most cameos carved in the 19th century were shell cameos, but there were also stone cameos. The most popular motifs were a woman's head and classical motifs. At the world expositions in London 1851 and Paris 1855, goldsmiths displayed jewellery decorated with gold and enamel flowers, usually blue or green. At the time the financial position of the middle classes had improved, which led to an increase in demand for jewellery. The period is usually called Neo Rococo and designers, particularly goldsmiths, were beginning to work with naturalistic forms, with flora and fauna as the major sources of inspiration. The locket became a favourite piece of jewellery in the late 19th century. It often had a folding lid where a lock of hair, a miniature portrait or a photograph could be concealed. Lockets could be made from gold with inset gemstones, or more basic versions were made from silver or metal-gilt. 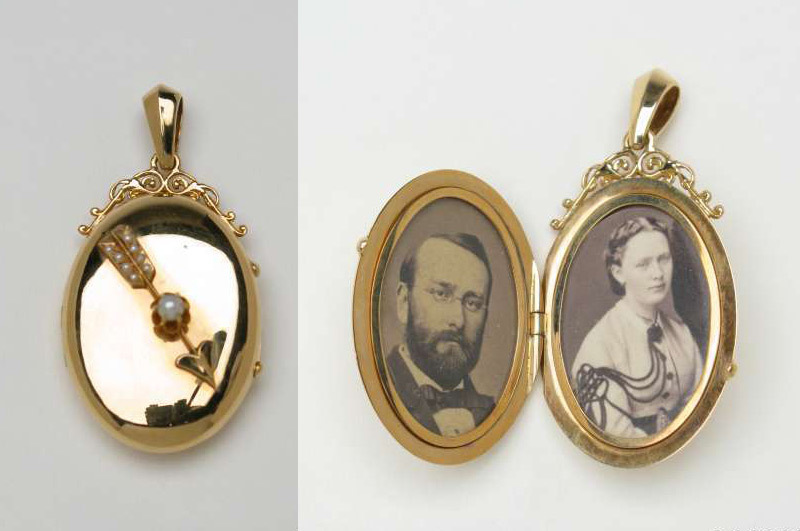 The locket contains black and white photographs of a man and a woman, taken during the latter half of the 1860s. Perhaps the owner's parents? Lockets were also popular betrothal gifts. The pendant was made in Paris by France's leading goldsmith during the Art Nouveau period – René Lalique (1860-1945). It is part of a series on the four seasons and depicts autumn. After training in Paris and London, Lalique began designing for the major jewellery houses of Cartier and Boucheron. In 1886 he opened his own workshop. Lalique exhibited at the World Exposition in Paris in 1900 and achieved tremendous success. In 1910 he acquired a glassworks in Combes-la-Ville (which is still in operation today) and stopped designing jewellery. This type of necklace is called a dog collar or choker in English, and a collier de chien in French. It should fit snugly round the neck. This style of necklace became modern in the 1880s and many of the royal and noble women of the time wore them up until around 1910. The necklace comprises 1,650 oriental pearls presented in 15 rows, divided by vertical batons of white gold, set with Ceylon sapphires and many small diamonds. 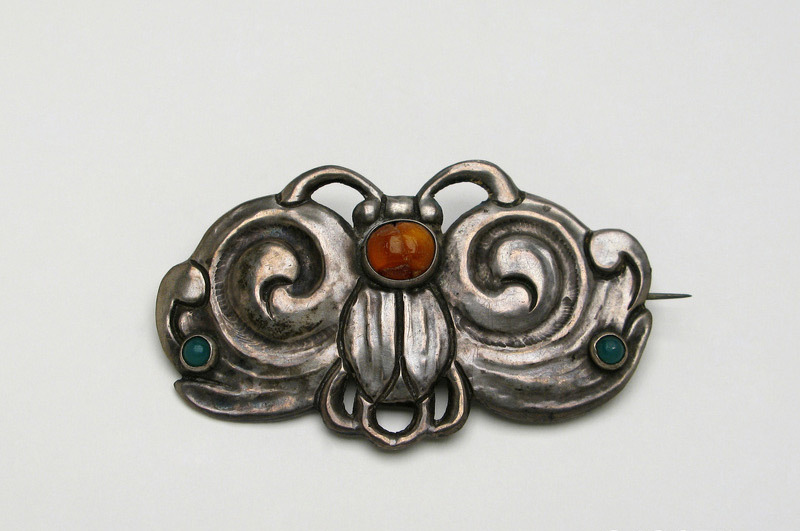 The pewter brooch has the soft organic forms associated with Art Nouveau. Pewter became popular again in the early 20th century. It was a 'genuine' material like silver and gold. Many items of pewter jewellery were designed within the English arts and crafts movement, which inspired silversmiths throughout Europe. Many silver and goldsmiths avoided working with expensive faceted stones during the Art Nouveau period. They preferred to use cabochon – highly polished and convex cut – jewellery stones. Amber was a favourite. 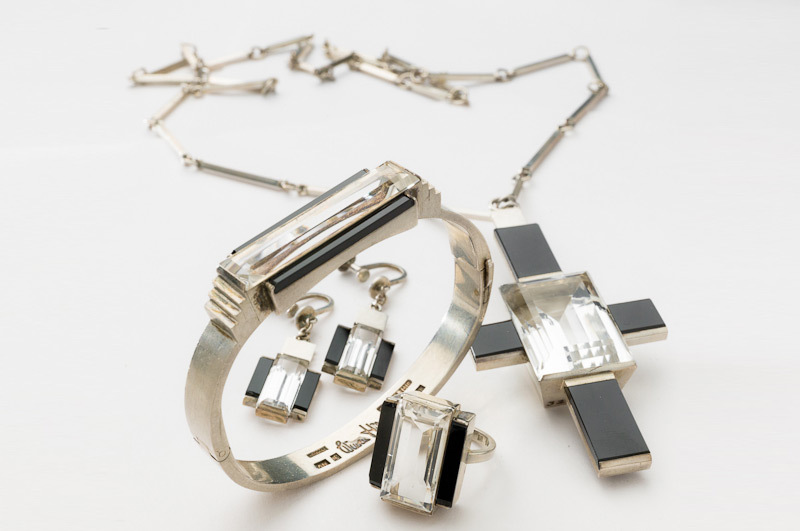 Just before 1930 Wiwen Nilsson (1897-1974) began designing his unique pieces – pendants, bracelets, rings and brooches in strict geometric designs. He usually worked in silver, and when he set stones he mainly used onyx and faceted rock crystals. The pendants garnered most acclaim. "An item for the modern woman" according to 1930s fashion writers. 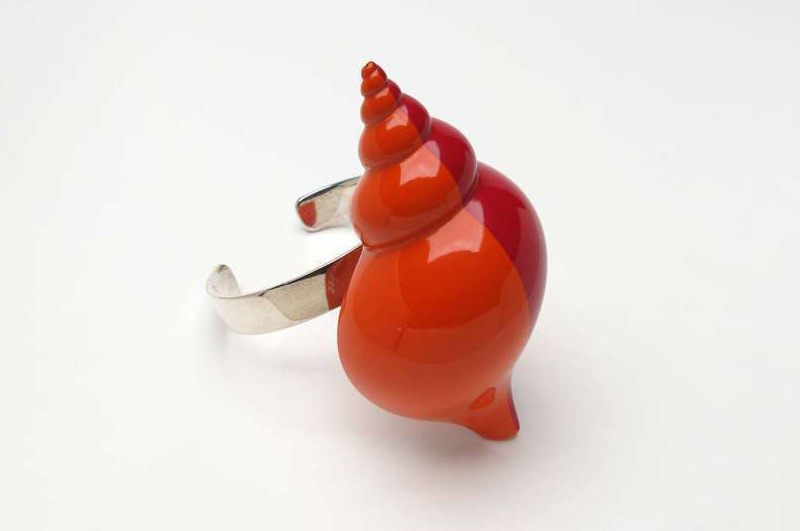 Wiwen Nilsson's jewellery art shows samples of strict modernism of the highest quality. This bracelet was made by Sigurd Persson in 1974. Even in the 1960s, several silversmiths had begun experimenting with alternative materials. Plastic jewellery was the answer some jewellery artists had to the anti-luxury mood prevalent among some circles of artists. Prestigious smith Sigurd Persson (1914-2005) was one of the biggest designers of the 20th century. He often took his inspiration from nature, but gave the design stylised features. Sigurd Persson has been a pioneer in many areas in his design. 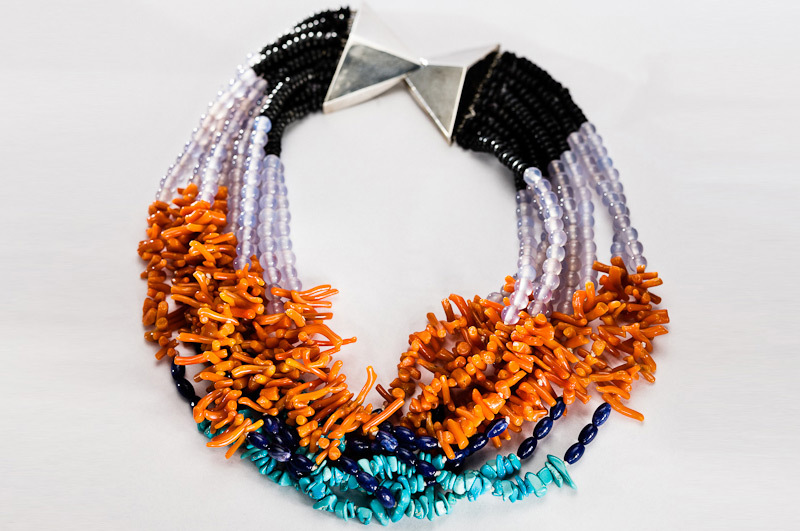 The 'Singoalla' necklace by Kristian Nilsson was a piece commissioned in 1982. Few Swedish jewellery artists have moved and stirred onlookers like Kristian Nilsson (1942-1989). Nilsson studied at Stockholm University College of Arts, Crafts and Design in 1965-69, and qualified with goldsmith Bengt Edvall. His jewellery brought about a change of scene among jewellery art in Sweden.